The Punjab Chief Minister Parkash Singh Badal today said that the SAD-BJP alliance government was fully alert and keeping a close tap to foil any nefarious attempt aimed at disturbing the law and order situation in the state.Interacting with the media persons on the sidelines of Sangat Darshan program in Malout assembly segment here today, the Chief Minister, while referring to media reports pertaining to possibility of terror attack during upcoming assembly polls, said that the state government was keeping a strict vigil over entire situation to crush the ugly head of anti-national forces which were trying to derail the peace and prosperity in the state. He said that some forces inimical to the development of state were constantly hatching conspiracies to vitiate the peaceful atmosphere of state but the Punjab government and the wise people of state would never allow these anti-social elements to succeed in their ulterior plans. Mr. Badal reiterated his government’s commitment to promote the ethos of peace, communal harmony and brotherhood in the state.The Chief Minister said that both the centre and the state government were closely monitoring the issue of security and the possibility of any attack towards the sovereignty and security of the country would be given a befitting reply. He said that Punjab being a border state was prone to such attacks but the state government was taking stock of the entire situation so as to avert any sort of untoward incident. “We are regularly in touch with Government of India on this crucial issue concerned with the security of country” added Mr. Badal. Replying to another query, the Chief Minister said that the Shiromani Akali Dal would release its Election manifesto for 2017 assembly polls at an appropriate time. He said that all he genuine demands of people and the vision of Akali Dal would be incorporated in this manifesto before it was made public.Ask to comment on the strict norms laid down for compensation to the next of the kin of the farmers who committed suicides, the Chief Minister said that the state government was committed to grant Rs. 3 lac as compensation promptly to the hapless families of these farmers. He said that besides this the state government has taken several farmer-friendly initiatives like free power, interest free crop loan of Rs 50000, health insurance and others for the farming community. 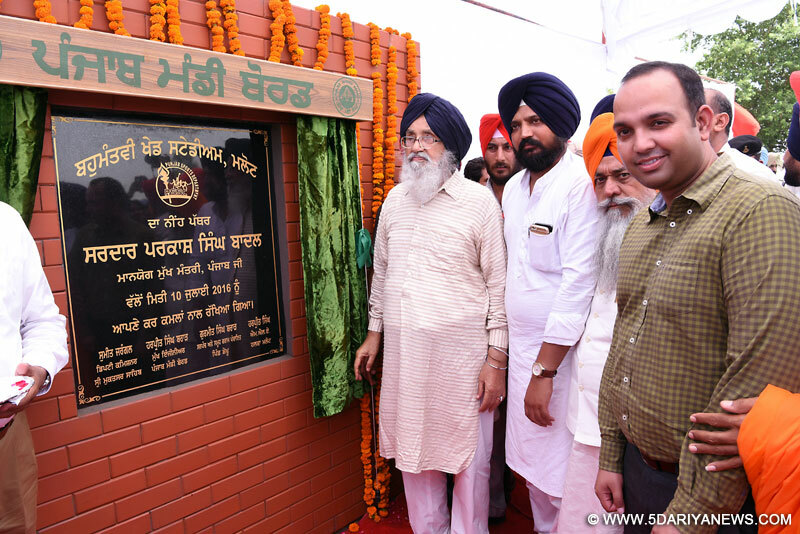 Earlier during the Sangat Darshan in Malout city, the Chief Minister announced that the Punjab government would soon come up with a comprehensive master plan to address the problem of water supply and sewerage in the city. He said once this master plan was ready, work in this regard would begin soon. On the occasion, the Chief Minister also felicitated Tykwando player Kunwar Preet Singh during Sangat Darshan program.Later, the Chief Minister laid foundation stone of Multi-purpose Stadium and 66KV Sub Station here to be completed at a cost of Rs. 6.36 cr and Rs. 4 cr. respectively.Mr. Badal also visited Mahanvir Gaushala and interacted there with its founder Pandit Girdhari Lal.The Chief Minister was accompanied by MLA Malout Mr. Harpreet Singh, Member Parliament Mr. Sher Singh Ghubaya, Chairman Punjab Agro Jathedar Dyal Singh Kolianwali, President Nagar Council Malout Mr. Ram Singh, Chairman Market Committee Malout Mr. Basant Singh, Member State Women Commission Mrs. Veerpal Kaur Tarmala, Deputy Commission Mr. Sumit Jaranghal and SSP Mr. Gurpreet Singh Gill.